Vintage Lorry Funerals: How David became interested in lorries. How David became interested in lorries. For those of you who regularly read this blog, it may have occurred to you, how did David Hall become interested in lorries? An interest that led to Vintage Lorry Funerals being established in 2002 started when David was an infant. David came from a humble background in County Durham, an area dominated by Coal Mines in the 1950’s. He lived in a two bedroomed house, commonly called a two up, two down, however the front room downstairs was never used. It was reserved for Christmas Day, any Wedding or a funeral, where the Deceased would lie in their coffin and the room essentially became a Chapel of Rest. The rear ground floor room was the hub of the home with a settee and a dinning table with the centrepiece being a coal fire, which in addition to housing an oven, it was the only source of heat. Vegetables were cooked in water and a kettle boiled on swing-out rings that were suspended above the fire. The fire was also the place where David was bathed in a tin bath that hung on the outside wall when not in use. Water from the kettle was used to heat up cold water in the bottom of the bath. A clothes-horse draped with towels became a modesty screen, David at the time thought that this was the clothes-horse’s prime function! The toilet was at the end of the yard and it was cold and dark on a winter’s night, although a skylight sometimes let in the moonlight. David slept head-to-toe with his baby sister and he often remembers the ice patterns that would grow on the inside of the window during the winter. 1, Smiths Terrace, Easington Lane had no front garden and the front door opened out onto the A182, a busy trunk road that linked Newcastle to Hartlepool. Opposite the house there was the main manhole for the street, with a top which didn’t fit properly and rattled every time a lorry went over it. So David’s earliest interest with lorries occurred during the night when he was woken with the jangling of the manhole cover. He became skilled in determining whether the lorry was a 4 wheeled rigid, a 6 wheeled rigid or an 8 wheeled rigid, based on their distinctive sound patterns. Also to keep young David entertained, his Mum used to lift him on top of the radiogram (there was no TV in the house) so that David could wave at the Milk Tanker Driver who was collecting from a nearby farm. However, the main reason for David’s interest in lorries stems from when their family van broke down on its way to Cumberland. David’s Dad was a Clerk at the Colliery and earned just enough to feed his family, however, there was nothing spare for luxuries, including holidays. There were no family holidays in the 1950’s, David’s family used to visit a farm in Cumberland, as it was known in the day, where David’s Mum had been evacuated during WWII. When a bomb from a Heinkel He 111 hit the side of the rail bridge in South Hetton and exploded in midair, glass from windows was shattered at a radius of 100 yards. This encouraged the owners of the Fish & Chip shop in South Hetton to send their young child over the Pennines in the knowledge that if the bomb hadn’t had a glancing blow on the bridge and had hit the ground, then none of David’s Mum’s family would have survived. So in August 1957 David’s Mum & Dad, David and his sister Susan in her carrycot were on their way to Unthank in a second hand Austin A40 Van. Initially the journey went well along the A690, apart from David being car sick in Crook, however, as the van was climbing the steep gradient towards the summit of Hartside there was a horrendous bang and the van came to a sudden stop. David’s Dad knew that it was serious and he obviously needed some assistance. In the 1950’s there weren’t many cars on the road and David vividly remembers the silence with only sheep bleating in the distance. After some time a motorbike approached and David’s Dad waved the rider down and he gave David’s Dad a lift to the Helm Wind Café, now called the Hartside Café, which sits on the summit, with stupendous views to the west to Lakeland and beyond. David’s Dad used his AA Key to unlock the AA Box and phoned the Farmer with whom they were intending to stay. The motorbike rider then took David’s Dad back to the stricken A40 van. It now seems incredulous the some unknown stranger should be so kind, however, in the 1950’s random acts of kindness were common place. With not many vehicles about it was the unwritten law of the road that you never ever passed a broken down vehicle without offering some assistance. It seemed a long time before the Farmer arrived in his Morris Minor Shooting Brake with a tow rope. The Farmer towed the A40 van to the top of Cross Fell and then let David’s Dad, on his own, coast some 6 miles downhill to the farm in Unthank, near Gamblesby. David’s Dad’s first concern was finding the money to pay for repairing the van and he decided that he should go straight home and get back to work. The Farmer took David’s Dad, David’s Mum and David’s baby Sister in her carrycot back to Easington Lane but there was no room in the car for David. So in August 1957, David aged 4 years and 4 months was left with the Farmer’s Daughter-in-Law, Alice Threlkeld. It was a strange situation for David because he had never been away from home before and he had never slept on his own before. It was also strange situation for Alice Threlkeld who was a young Farmer’s Wife who at the time had no children of her own. However, she was experienced with young children being a Sunday School Teacher at Gamblesby Methodist Church. Alice need not have been worried about looking after David because she had an ace card up her sleeve, her Dad was Albert Kelso who owned Fellside Transport and operated nine lorries mainly on livestock movements. Albert and his wife, who everyone called Ma, visited Alice on the Sunday and there was an immediate chemistry established between David and Albert who christened him ‘Mr. Crockett’, after the western character Davy Crockett. Albert and Ma took David back to Lazonby in their Standard Vanguard and he spent the next two weeks there whilst the Crankshaft of the A40 van was replaced. The Austin van was repaired by Lace Brothers Garage in Lazonby who were great friends with Albert Kelso and it is understood that Albert encouraged Howard Lace to give the A40 priority and also to sharpen his pencil when it came to their costings. Ma Kelso always called David M’Lad and held his hand as they went up the stone staircase of Croft House, leading David to an enormous bedroom. That night David slept right through with no lorries going over manhole covers to keep him awake, only the sound of sheep bleating in the fields. 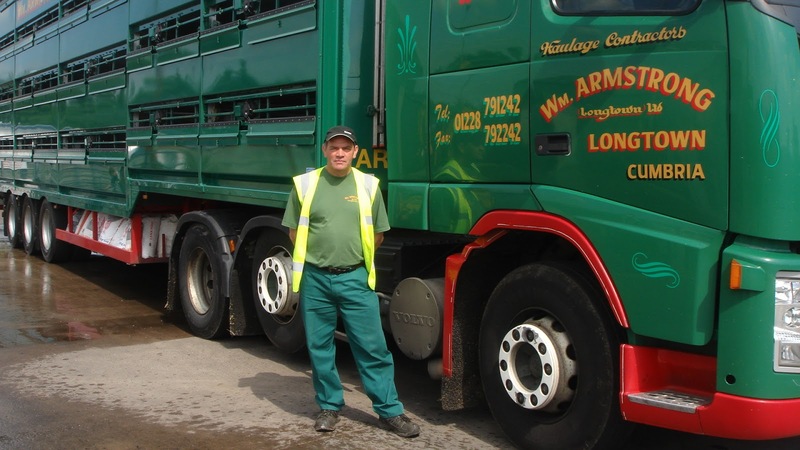 David spent the next two weeks in the cabs of livestock collection lorries taking sheep, cattle and pigs from farms into the Auction Mart at Penrith, which was then in the middle of the town but now is a Morrisons Supermarket. David was normally a bad traveller on car journeys, however, he never felt sick in a lorry which was much higher and he could see animals in the fields over the top of hedgerows. Albert Kelso had built up a very successful business buying second hand Leyland Beaver chassis from BP and other oil companies who had discarded their vehicles after 5 years, in line with their large company depreciation policies. These chassis cabs were painted grey with red mudguards, and a wooden deck, with a lift-off livestock container which was created by the team at Fellside Transport. Albert was a great admirer of Leyland Beavers as the vehicle was robustly built, a 120 b.h.p. engine that would go up Shap Fell on the A6 in top gear and had an amazing lock which meant that a Leyland Beaver could get into a tight farmyard entrance that other lorries couldn’t access. In 1957 Albert gave David a Leyland Cap Badge which David still uses today on his Beret as he drives his Leyland Beaver in funerals. John Kelso took over the business when Albert passed away in 1971 and in 2004 David received a package in the post from John and Ma Kelso. It was an AA Badge that had been on one of the lorries. The picture below shows David in Cwmbran with his Drivers Qualification Card, which all Lorry Drivers must now possess. In 2018 sadly only Alice Threlkeld and Alan Kelso, Albert’s Grandson are still around. 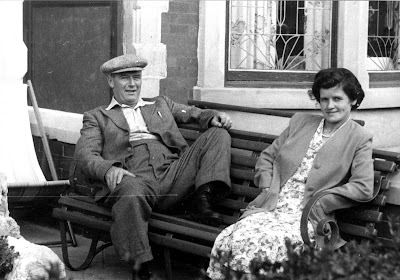 David regularly writes to Alice updating her of developments and he often recalls that during the 1950’s she was the only person in Unthank who had a telephone, everyone else gave the number of the call box in the centre of the village as their ‘personal’ phone number. When the phone rang any passerby would answer it, ask who was speaking and who they wanted to contact, before running to tell Eric Mason that a relation was on the phone. The ladies of the village used to take turns in cleaning the Telephone Call Box. Alan Kelso is probably the youngest person to obtain a Driving Licence, passing his test at 0930 hours on his 17th Birthday driving a 3 Ton Commer Lorry from Fellside Transport. He is still involved in livestock movements, managing this part of the Armstrong of Longton business. He works exceptionally long hours, however, he is always available to discuss any points David needs advice on regarding the 1950 Leyland Beaver.